Ama is no more ... long live Harumafuji! 2008 has witnessed varying fortunes for the Mongolian rikishi. Asashoryu no longer dominates the sport by a distance and, following his departure from the Aki basho after 10 days of competition, he didn't even participate in the final tournament of the year. On the other hand, his countryman Ama has reached his highest level to date and has delighted sumo lovers with three superb tournaments. Appropriately he will start the year 2009 ranked at ozeki. From now on, it will not be Ama whose performances we will follow, but Ozeki Harumafuji! Ama, who is still only a young man, was born Byambadorj DAVAANYAM on 14 April 1984 in Mongolia. His father was a Mongolian wrestling champion. Byambadorj was discovered in his home country by Ajigawa oyakata. That day, which was the occasion of the wedding of the pioneer of Mongolian rikishi, Kyokushuzan, the young man was taking part in a Mongolian wrestling tournament, together with Batundrah GANBOLD. Both of them will join Ajigawa beya: Byambadorj will become Ama and Batundrah will become Ako (and then Toranoyama). The latter, despite a satisfactory debut, has never progressed higher than sandanme division, and is currently back down in jonidan division. So Ama arrives in Japan in September 2000. Aged 16 and still growing, he is 180 cm tall and weighs only 80 kg. This is quite a light frame, which he will hardly have time to build up before his mae-zumo debut in January 2001. At the following tournament, he is ranked at jonokuchi 29 west and, thin as he is, wins the yusho. Unbeaten, he wins with a zensho yusho! Such a victory propels him right up the jonidan division to the rank of jonidan 22 east. He does not win the yusho this time, but gains a very good score of 5-2 which means that he is not languishing in this division, but will fight in sandanme at the Nagoya basho 2001. Ama then stays within sandanme although he continues to gather kachi-koshi and progress. When he is in his fifth tournament in sandanme division, the young man again has a good month in March, when he makes a deep impression: he wins the Haru basho 2002 with a zensho yusho. He is just starting his second year as a rikishi. He now weighs 88kg and moves up to makushita division. Matters now become a little more complicated and he makes his first acquaintance with make-koshi. Three scores of 2-5 in four tournaments cause him to drop down to makushita 46, but he doesn't drop out of the division. He pulls himself together and, from January 2003, he starts to make progress again. In March 2004, after 19 tournaments (including mae-zumo), three years after his debut and his first success in jonokuchi, the Mongolian rikishi joins the salaried ranks and enters the juryo division ranked at juryo 12 east. He is nearly 20, 184 cm tall and weighs 113 kg: he has grown 4 cm and gained 26 kg in weight since his debut three years before. In his first juryo tournament, he obtains a double-digit winning score, 10-5. He will have been beaten by his countrymen Hakuho (juryo 11 east) and Tokitenku (juryo 11 west), but will have got the better of Korean Kasugao (juryo 6 west). In May, at the Natsu basho, he is ranked at juryo 7 east and finishes make-koshi, but without having too much to be embarrassed about. He's beaten by, among others, Roho (juryo 6 west), Wakanoyama (juryo 8 east), Toyonoshima (juryo 13 west), Tamakasuga (juryo 1 east), Kasugao (juryo 2 east) and Tokitenku (juryo 10 west). This hitch will not be repeated at the Nagoya basho where he returns to kachi-koshi. In September, he enters the Aki basho at the rank of juryo 4 east. To mention only a few of his opponents, he will be beaten by Toki (juryo 2 east), but will beat Kasuganishiki (juryo 4 west), Kasugao (juryo 1 west), Tokitenku (juryo 2 west), Wakanoyama (juryo 3 east), Hakurozan (juryo 14 east) and Kotoshogiku (juryo 5 west). This run will allow him to finish with a score of 11-4, win the yusho and gain promotion to the makuuchi division for the Kyushu basho 2004. He's the seventh Mongolian rikishi to get there. 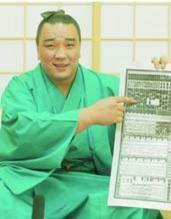 He was preceded by Kyokushuzan, Kyokutenho, Asashoryu, Asasekiryu, Hakuho and Tokitenku. When he arrived in the world of sumo, he was a rather lightweight, But that is the case with many Mongolian rikishi, who have come from Mongolian wrestling where weight is not quite so important. For example Hakuho, who is a year younger and made his debut one tournament after Ama, was then the same weight and the same height (180 cm, 80 kg). Although there is nothing that he can do about its height, Ama will also face difficulties in putting on weight (Ed: one can read the autobiography of Kirishima, "Memoirs of a Sumo Wrestler" translated into French by Liliane Fujimori, to realise what a daily struggle it can be to gain weight.) Today he is 24 kg lighter than Hakuho, who is only 7 cm taller. Asashoryu, who is the same height as Ama, weighs 20 kg more. It is difficult to know how much impact this problem has had on Ama’s progress up the banzuke. It is still true that he is light for the division. As for his sumo, it is aggressive and shows great technique. His tachi-ai is low and penetrating. He uses leg techniques from Mongolian wrestling in the way he carries out throws. He is also very fast. He is a difficult opponent who can at any time surprise any adversary, no matter what his weight. To cite only one or two examples, remember the legendary okuri-tsuriotoshi that he inflicted on Goeido (140 kg at that time, compared with 126 kg for Ama) on the 12th day of the Aki basho 2007 (see Le Monde du Sumo #24). Or also the no less memorable utchari on the eighth day of the last Natsu basho which sent Wakanoho (154 kg compared with 124 kg for Ama) into a mad rage (see Le Monde du Sumo #30). When he is promoted to makuuchi division, Ama is ranked maegashira 14 east. It will be his lowest rank and he won't stop making progress on the banzuke. During his first nine tournaments, he will only be make-koshi once. Even at the Hatsu basho 2005, he will achieve eight wins before he has to withdraw with sciatica, for the only time in his career. He then becomes komusubi at the Natsu basho 2006. In nine tournaments, he won two technique prizes and a kinboshi, against Asashoryu at the Hatsu basho 2006. He makes fast progress to sanyaku, but is on the receiving end of a severe make-koshi of 4-11 and drops back to the maegashira ranks. He will again be make-koshi at the Nagoya basho before starting a brilliant recovery: at the Aki basho 2006 he ends with a score of 11-4, achieves jun-yusho (the second best score) and receives the fighting spirit prize. Maegashira 1 at the following tournament, he is unfortunately make-koshi with a score of 6-9. It is a surprising make-koshi when one knows what is awaiting Ama at the end of 2006: on 28 December, his father is killed in Mongolia in a car crash from which his elder brother Sakuvadorj survives. The young man goes home but is unable to be present at the funeral. 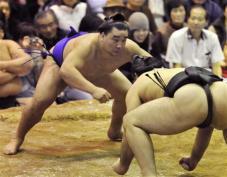 In fact, from 7 January, he is on the dohyo for the Hatsu basho 2007. Deeply upset, he nevertheless has a brilliant tournament and is rewarded with a score of 10-5 and, as an amazing gift to his father's memory, he returns to the sanyaku ranks. This time it will be for good and he won't be demoted again. His course from then on will be one of constant progress, with only one slight hitch at the Nagoya basho 2007, which he will finish make-koshi with a score of 7-8. At the other tournaments he scoops most of the prizes: four outstanding performance prizes and three technique prizes. He will also achieve jun-yusho twice. In 11 tournaments, he will obtain five double-digit scores. He will also earn the nickname of "Hakuho killer". In fact, he will beat his compatriot, now yokozuna, three times in a row, at the Aki and Kyushu bashos 2007 and at the Hatsu basho 2008. He will repeat the performance at the Natsu basho 2008. The end of the year 2007 marks a turning point for Ajigawa beya. It changes its name to Isegahama, that of a stable which was closed in February of the same year in the absence of someone to take it over. The rule for promotion to the rank of ozeki is at least 33 wins in three successive tournaments. With scores of 10-5 and 12-3 obtained at the Nagoya and at the Aki bashos 2008, respectively, everything is on the line for Ama at the Kyushu basho 2008. After two wins, he suffers two losses, which allows the doubts to creep in. But the tenacious Mongolian doesn't give in and will seize his chance: he is and neck for the yusho with Hakuho (whom he also beats on the 12th day) right up until the final day, when both men achieve a score of 13-2. Whatever the outcome of the tournament, his promotion is sealed. Alas, following an additional bout, for which he doesn't need to feel ashamed, he is beaten by the yokozuna. Ama will not be able to kill two birds with one stone by also winning his first yusho in makuuchi division, but he will gain great joy all the same. Ama’s promotion was well known for several days before being made official on 26 November. It was also known that the rikishi was going to take a new shikona, Ama not really seeming to suit an ozeki, because of the use of the character "安" which means "tranquillity or peace" but also "cheap"! This was a much discussed change of name. The interested parties wanted it to be completely new, but also to suit the tradition of Isegahama beya: discussions included the re-use of certain characters from the shikona of former Isegahama beya yokozuna Terukuni (照国), former ozeki Kiyokuni (清国), and, of course, from the fighting name of Isegahama oyakata, Asahifuji (旭富士). Because of its importance in Mongolia, Ama wanted to keep the character "馬" for horse. The idea of keeping "Ama", although written differently, was also mooted. In the end, it will be Harumafuji (日馬富士) which is made up as follows: 日 (which is only read as "haru" in names) the sun, indicating the wish to shine in the world of sumo, 馬 (ma), the horse, for the reasons given earlier and 富士 (fuji), from the shikona of Isegahama oyakata. Ama officially becomes ozeki Harumafuji on 26 November, a promotion approved "unanimously", as stated by Musashigawa rijicho. 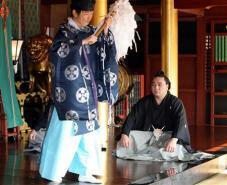 A Shinto ritual takes place at the Daizaifu Tenmangu Temple, in Fukuoka prefecture. The new ozeki nervously makes a short speech full of the knowledge that he has taken on responsibilities associated with his new rank: "I'm very impatient to start the Hatsu basho. I feel the duties I'm taking on very strongly." The last ozeki to have been promoted was Kotomitsuki in September 2007. Harumafuji is the seventh non-Japanese ozeki and the third Mongolian, after Asashoryu and Hakuho. 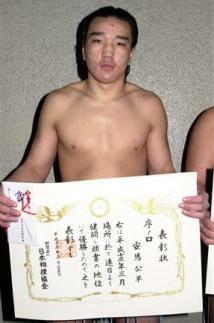 Since his debut he has seen five rikishi reaching the rank. Isegahama beya has not witnessed such an event since 1969, with the promotion of Kiyokuni. But before the official tournament in January, the first appearance of ozeki Azumafuji took place at a winter tournament (2-20 December 2008). On this occasion, he repeated his wish to be worthy of his rank "I must now win a tournament. I will do my utmost in training to become an ozeki recognized by everyone." If he does not lose his characteristic obstinacy, there is no doubt that he will achieve this and continue to delight sumo enthusiasts with his technical brilliance. On 26 November, at a meeting of the Nihon Sumo Kyokai held in Fukuoka, the Board of Directors (rijikai) and the committee charged with producing the banzuke for the January tournament (starting on 11 January) approved the promotion of sekiwake east Ama to the rank of ozeki. On the same day Ama changed his shikona and has become Harumafuji. After the traditional acceptance ceremony, where he seemed nervous, Harumafuji appeared smiling broadly in front of the press. Harumafuji: I am really happy. It is thanks to all your support that I have managed to achieve such a successful tournament. Question: How did you cope with the ceremony? Harumafuji: I was a bit nervous, but with such a good atmosphere it was fantastic. Question: Did you practise your speech? Harumafuji: I went over it goodness knows how many times yesterday and this morning. Question: What did you mean by "body and spirit" (zenshin zenrei, "全身全霊") which you mentioned in your speech? Harumafuji: I really like the expression "isshokenmei" (with all my heart) and they told me how to say it like that in correct Japanese. It means that up to this point I have done my best and that I want to continue to do so. I kept practising it over and over again to make sure that everyone would be able to understand me. Question: You really wanted to become ozeki. 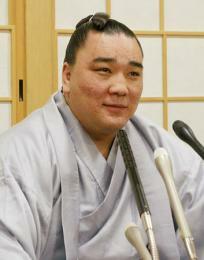 Harumafuji: When I arrived here from Mongolia, the ozeki seemed to me to be as distant as gods. I really admired their bearing and their power. I want to continue the way I have up to now, training with dedication and doing the sort of sumo that makes people happy, so as not to sully the rank of ozeki. I want to become a strong ozeki, who can be proud in front of everyone. Question: What about your new shikona? 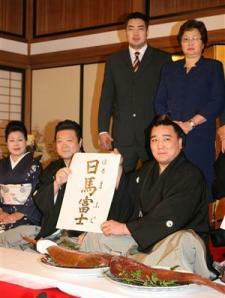 Harumafuji: I am really happy to have received such an amazing name. It was chosen by thinking about the meaning of the characters. I wanted to keep the "馬" (horse), which is lucky in Mongolian tradition. "富士" comes from the name of my shisho, so I want to do my best to carry the name even higher. I want to produce some fine performances. Question: With whom would you like to share your happiness? Harumafuji: With my father (who died in 2006 in a car accident). In November last year when I went to visit his tomb, I said to him: "If I make it to ozeki I will come to see you. I will not come back until then" I have made my mother very happy too. Question: What sort of ozeki would you like to become? Harumafuji: This Kyushu tournament, where I was involved in the yusho race, was a very good experience and taught me a great deal. I want to train hard in order to develop my physique and do powerful sumo, worthy of an ozeki. Harumafuji's (as Ama) career statistics, and daily results in the three basho leading to his Ozeki promotion.